Let’s Start With Some Questions! A Serial Dieter That Has Tried Just About Everything In The Past To Lose Weight? Totally Fed Up Of Only Short Term Success On The Latest Faddy Diets, Yo-Yo Dieting and Starvation Diets? Getting Annoyed and or Depressed That You Aren’t Seeing Weight Loss Results? If this sounds like you, then I can help! My name is Tony Ord I am one of Harborne’s leading personal trainers and weight loss experts. Provide a totally mobile service, that means you don’t need to join a gym or even leave the house. Work with you 1-2-1 on all areas of your diet, habits and fitness. Provide you will a personalised real food diet system with easy to follow recipes, shopping lists and daily planners. Help you get that health and fitness mindset so it fits around your life with minimal effort, but with maximum results. 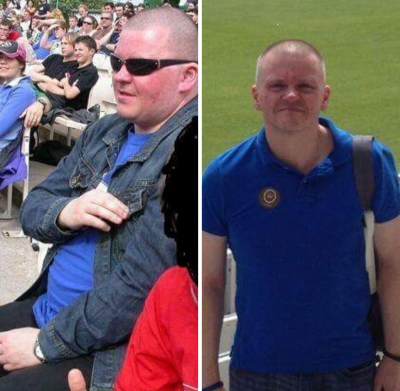 As you can see from the photos above, I have previously been overweight myself, so I know what hurdles you can face on your weight loss and fitness journey. My personal training support includes, tailored fitness and weight loss support in a 1-2-1 setting. My background in fitness started when I realised how overweight and unfit I was and I took action and did something about it. I’m now here to help you make the same changes in your lifestyle. I provide my Mobile Personal Training across Birmingham and the surrounding area. Before there is any commitment to personal training I always provide a FREE Consultation. We are continuing to enjoy Tony's work. He is flexible, punctual and provides a varied workout which keeps us motivated and interested. We looked for a personal trainer to help with our motivation for doing exercise, and we certainly look forward to his sessions.